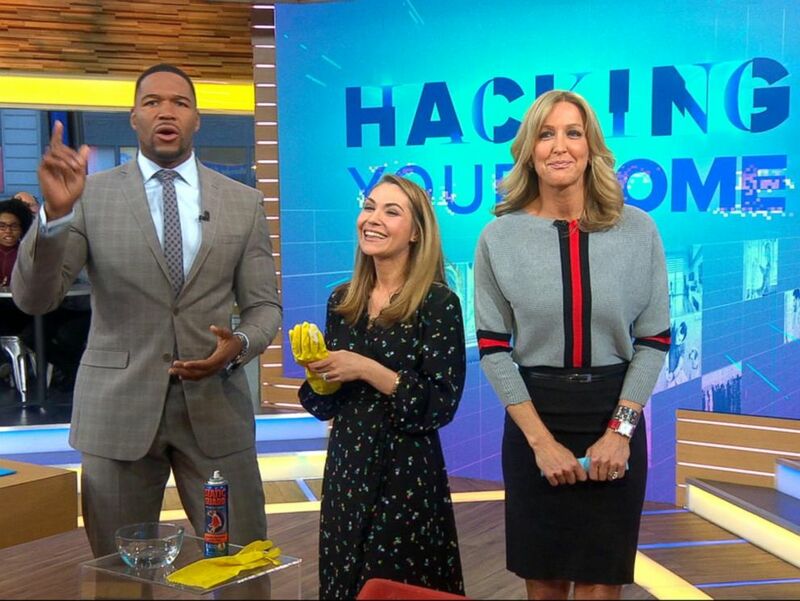 Good Housekeeping style director Lori Bergamotto appeared on "Good Morning America" today to share some of her top hacks for easy and cost-saving ways to tidy up your home using items you most likely already have around the house. Good Housekeeping style director Lori Bergamotto demonstrates four cleaning hacks with everyday items already in your home. PHOTO: Good Housekeeping style director Lori Bergamotto demonstrates how to use ketchup and salt to polish copper. If your copper items are starting to look tarnished, simply squirt some ketchup onto a rag and then sprinkle some salt on top of it. Rub the mixture onto your copper items and repeat until you've covered their entire surfaces. Finally, rinse off the mixture to reveal the shiny, polished, copper. PHOTO: Good Housekeeping style director Lori Bergamotto demonstrates how to use aluminum foil as a scrub brush. If you don't have a dish scrubber handy, Bergamotto recommends simply balling up some foil and using this instead. PHOTO: Good Housekeeping style director Lori Bergamotto demonstrates how to use a lint roller to pick up glitter and glass. If you have children who have made a mess either with glass or while making a glittery craft, you know how hard it can be to pick up fine shards of glass or tiny pieces of glitter. PHOTO: Good Housekeeping style director Lori Bergamotto demonstrates how to use bread to pick up glitter and glass. Bergamotto recommends using white bread, or even a bagel, to clean up these messes. You can also use a lint roller. First, sweep up any big shards and then go in with the piece of bread or lint roller to get any of the fine shards that were left behind. PHOTO: Good Housekeeping style director Lori Bergamotto demonstrates how to use static spray to clean up pet hair. If pesky pet hair gets caught in any upholstered furniture, simply spray the fabric with an anti-static spray. This breaks the charge that causes fur to cling to these surfaces, and makes the fuzz easier to gather or vacuum up, according to Bergamotto.